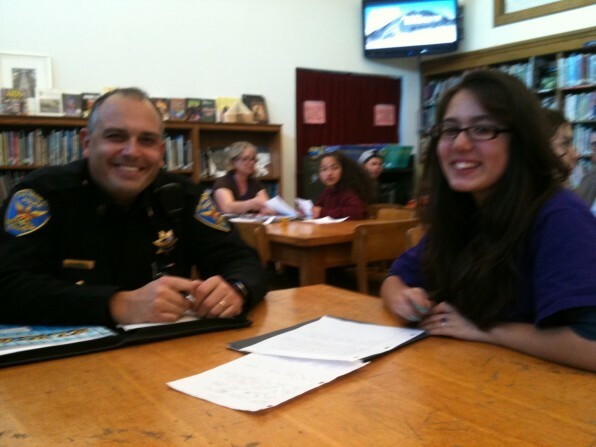 Three student-journalists from Slick magazine recently interviewed the SFPD’s own Captain Bob Moser and Sergeant Marty Halloran. The captain and sergeant graciously fielded hard-hitting questions posed by these enthusiastic eighth-graders on the topics of racial profiling and narcotics trafficking. The Slick team benefited greatly from the knowledge and experience of these policemen, and we at 826 Valencia are grateful that they made the trip to the Writers’ Room at James Lick to spend time with us! Look for the students’ take on these difficult issues–along with articles of more levity (Crepes! Bad comedians! )–in the latest edition of Slick magazine that hits the shelves of the 826 Valencia pirate store this May.